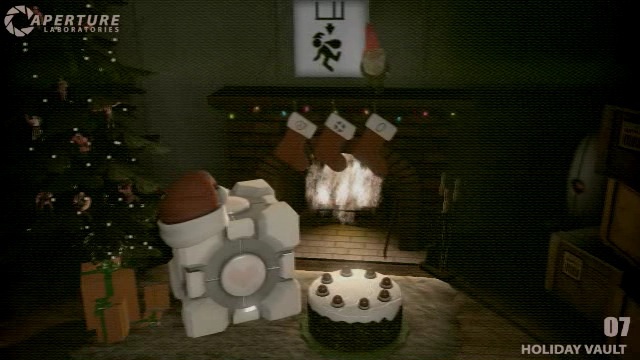 Valve recently posted a new video on ApertureScience.com, featuring a "holiday vault" that showed the weighted companion cube wearing a Santa hat sitting beside a cake in front of a fireplace. Since a picture is worth a thousand words - I can go on and on to describe the vault - you should see the screenshot below. Anyhow, there's enough stuff to let your eyes feast upon in the holiday vault. What really struck my interest was the sign right above the fireplace, where a gnome is also staring into your eyes. Anyone who's played Portal (or seen it) should be familiar of the various signs and logos present in each testing chamber (see right), denoting what puzzles and hazards are in the chamber. 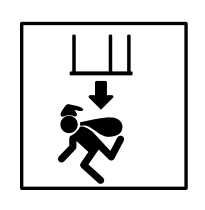 The sign above the fireplace is a humorous self-parody of the testing chamber signs and Santa Claus running down the chimney. Because of this, I've decided to recreate the sign in Inkscape, polishing my vector path editing skills along the way. The SVG source is also available.